The class is a General Fuse algorithm - base algorithm for the algorithms in the Boolean Component. Its main purpose is to build the split parts of the argument shapes from which the result of the operations is combined. The result of the General Fuse algorithm itself is a compound containing all split parts of the arguments. Gluing options - allows to speed up the calculation of the intersections on the special cases, in which some sub-shapes are coinciding. Disabling the check for inverted solids - Disables/Enables the check of the input solids for inverted status (holes in the space). The default value is TRUE, i.e. the check is performed. Setting this flag to FALSE for inverted solids, most likely will lead to incorrect results. BOPAlgo_AlertUnableToOrientTheShape - in case the check on the orientation of the split shape to match the orientation of the original shape has failed. BOPAlgo_AlertBuilderFailed - in case building splits of arguments has failed with some unexpected error. Adds the argument to the operation. Returns the list of arguments. Builds the result shape according to the given states for the objects and tools. These states can be unambiguously converted into the Boolean operation type. Thus, it performs the Boolean operation on the given groups of shapes. The result is built basing on the result of Builder operation (GF or any other). The only condition for the Builder is that the splits of faces should be created and classified relatively solids. All faces from each group having the given state for the opposite group will be taken into result. 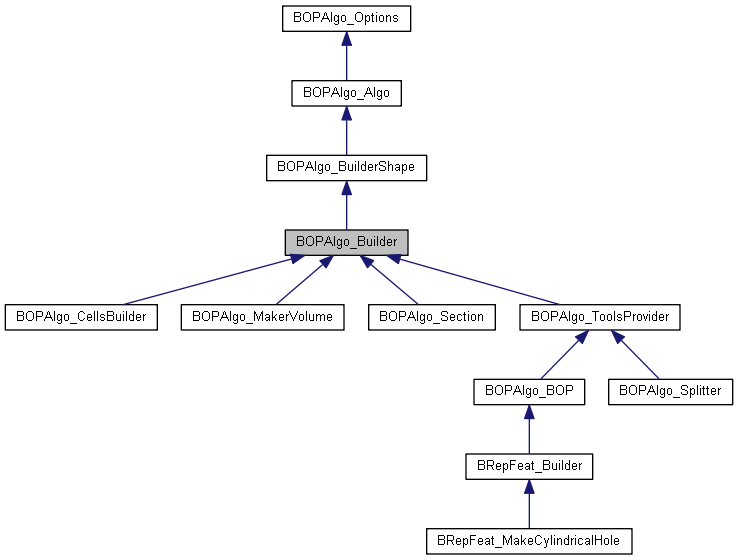 Such approach shows better results (in comparison with BOPAlgo_BuilderSolid approach) when working with open solids. However, the result may not be always correct on such data (at least, not as expected) as the correct classification of the faces relatively open solids is not always possible and may vary depending on the chosen classification point on the face. History is not created for the solids in this method. To avoid pollution of the report of Builder algorithm, there is a possibility to pass the different report to collect the alerts of the method only. But, if the new report is not given, the Builder report will be used. So, even if Builder passed without any errors, but some error has been stored into its report in this method, for the following calls the Builder report must be cleared. BOPAlgo_AlertUnknownShape - the shape is unknown for the operation. theReport - The alternative report to avoid pollution of the main one. Builds the result of Boolean operation of given type basing on the result of Builder operation (GF or any other). The method converts the given type of operation into the states for the objects and tools required for their face to pass into result and performs the call to the same method, but with states instead of operation type. COMMON is built from the faces of objects located IN any of the tools and vice versa. CUT is built from the faces of the objects OUT of the tools and faces of the tools located IN solids of the objects. theReport - The alternative report to avoid pollution of the global one. Builds the draft solid by rebuilding the shells of the solid with the splits of faces. Builds the result of operation. The method is called for each of the arguments type and adds into the result the splits of the arguments of that type. Reimplemented in BOPAlgo_BOP, and BOPAlgo_Splitter. Builds the splits of faces using the information from the intersection stage stored in Data Structure. Builds the splits of the solids using their draft versions and faces located inside. Reimplemented in BOPAlgo_MakerVolume, BOPAlgo_BOP, BOPAlgo_Splitter, and BOPAlgo_Section. Checks if the intersection algorithm has Errors/Warnings. Returns the flag defining whether the check for input solids on inverted status should be performed or not. Clears the content of the algorithm. Reimplemented in BOPAlgo_CellsBuilder, BOPAlgo_MakerVolume, BOPAlgo_BOP, BRepFeat_Builder, and BOPAlgo_ToolsProvider. Returns the Context, tool for cashing heavy algorithms. Builds the image of the given compound. Fills the images of compounds. Builds the image of the given container using the splits of its sub-shapes. Fills the images of containers (WIRES/SHELLS/COMPSOLID). Fills the images of edges. Add internal vertices (if any) to faces. Fill internal shapes for the splits (Wires and vertices). Fills the images of vertices. Finds faces located inside each solid. Classifies the vertices and edges from the arguments relatively splits of solids and makes them INTERNAL for solids. Classifies the alone vertices on faces relatively its splits and adds them as INTERNAL into the splits. Looks for the same domain faces among the splits of the faces. Updates the map of images with SD faces. Returns the glue option of the algorithm. Returns the map of images. Returns the list of shapes generated from the shape theS. Similarly to LocModified must be redefined for specific operations, obtaining Generated elements differently. Prepare history information for the input shapes taking into account possible operation-specific modifications. For instance, in the CellsBuilder operation, additionally to splitting input shapes the splits of the shapes (or the shapes themselves) may be unified during removal of internal boundaries. In this case each split should be linked to the unified shape. To have correct history information, the method should be redefined in each operation where such additional modification is possible. The input shape <theS> should be the one from arguments, and the returning list should contain all final elements to which the input shape has evolved, including those not contained in the result shape. The method returns pointer to the list of modified elements. NULL pointer means that the shape has not been modified at all. The General Fuse operation does not perform any other modification than splitting the input shapes basing on their intersection information. This information is contained in myImages map. Thus, here the method returns only splits (if any) contained in this map. Returns the flag that defines the mode of treatment. In non-destructive mode the argument shapes are not modified. Instead a copy of a sub-shape is created in the result if it is needed to be updated. Returns the map of origins. Returns the Data Structure, holder of intersection information. Performs the operation. The intersection will be performed also. Reimplemented in BOPAlgo_MakerVolume, BOPAlgo_BOP, and BOPAlgo_Splitter. Performs the building of the result. The method calls the PerfromInternal1() method surrounded by a try-catch block. Performs the building of the result. To build the result of any other operation it will be necessary to override this method. Reimplemented in BOPAlgo_CellsBuilder, BOPAlgo_MakerVolume, BOPAlgo_BOP, and BOPAlgo_Section. Performs the operation with the prepared filler. The intersection will not be performed in this case. Post treatment of the result of the operation. The method checks validity of the sub-shapes of the result and updates the tolerances to make them valid. Returns the PaveFiller, algorithm for sub-shapes intersection. Prepares the result shape by making it empty compound. Prepare information for history support. Sets the list of arguments for the operation. Enables/Disables the check of the input solids for inverted status. Sets the glue option for the algorithm. Sets the flag that defines the mode of treatment. In non-destructive mode the argument shapes are not modified. Instead a copy of a sub-shape is created in the result if it is needed to be updated. This flag is taken into account if internal PaveFiller is used only. In the case of calling PerformWithFiller the corresponding flag of that PaveFiller is in force. Returns the map of Same Domain (SD) shapes - coinciding shapes from different arguments. Check inverted option allows disabling the check of input solids on inverted status. Context - tool for cashing heavy algorithms such as Projectors and Classifiers. Data Structure - holder of intersection information. EntryPoint - controls the deletion of the PaveFiller, which could live longer than the Builder. Gluing option allows speeding up the intersection of the input shapes. Images - map of Images of the sub-shapes of arguments. InParts - map of own and acquired IN faces of the arguments solids. Fence map providing the uniqueness of the shapes in the list of arguments. Safe processing option allows avoiding modification of the input shapes. Origins - map of Origins, back map of Images. Pave Filler - algorithm for sub-shapes intersection. ShapesSD - map of SD Shapes.